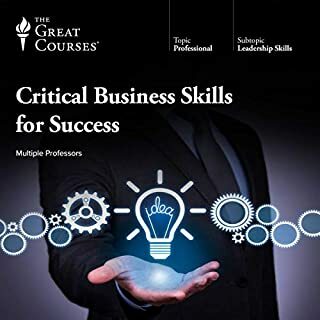 Anyone who is looking to expand their perception on critical thinking skills in a way that will be better your life, this is the course. Narration was good but don't like the clap track that seems to be added in. 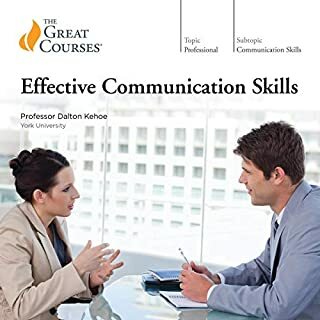 Great lectures, in the Information Age these lectures gives one great tips how to filter the information and get to bottom of what’s right information. 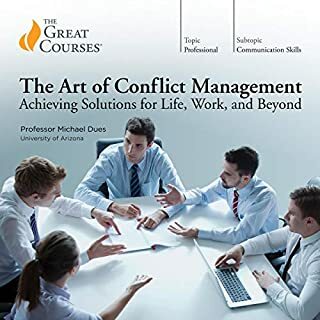 Another well put program by Great Courses. Thanks Great Courses. Dr. Steven Novella, is a master at explaining how our minds are deceptive to ourselves. How our minds trick us into thinking things that aren't really reality. And what to look out for in deception of marketing, relationships, how we are deceived by others and how we deceive ourselves and others without consciously being aware of it. 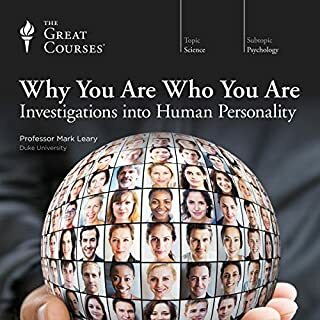 Dr. Novella uses a multitude of great examples that all of us can easily relate to from our past experiences. By bringing his knowledge and insightfulness to our conscious awareness, we can see and live in a world whereby we recognize deception for what it is. To not be fooled again. To understand that most of our previous beliefs, about virtually everything, are often deceptions without having scientifically based evidence to support them. Dr. Novella has certainly opened my mind, and I'll be buying up all his audio books to learn more. Would you try another book from The Great Courses and/or Professor Steven Novella? What aspect of Professor Steven Novella’s performance would you have changed? The information he presents is almost identical to his Great Course on Medical Myths. 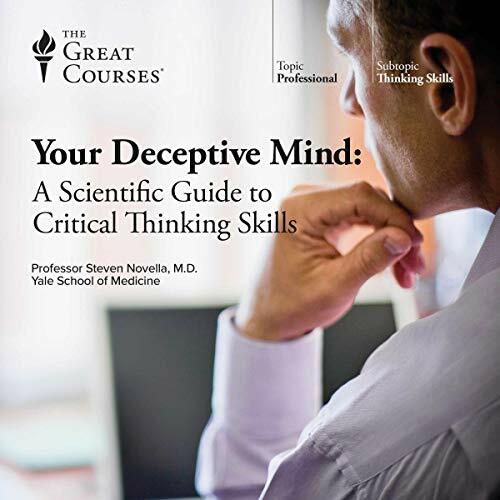 Was Your Deceptive Mind: A Scientific Guide to Critical Thinking Skills worth the listening time? Yes, I enjoy the information presented in "The Great Courses". 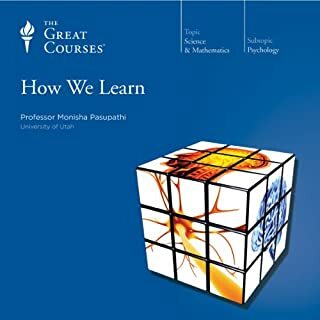 I listened to "Medical Myths, Lies, and Half-Truths: What We Think We Know May Be Hurting Us" by Professor Novella as part of "The Great Courses" a couple of weeks before. 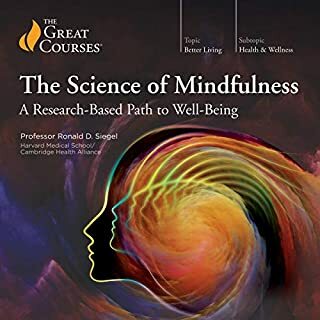 I felt that this book was just a rehash of the same information under the guise of a different topic (the mind) as opposed to the Medical Profession. 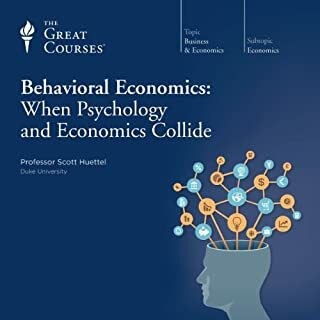 I recommend that users/members take one of Professor Novella's courses and not both since you will be frustrated he just goes over the same information. I do appreciate his "skeptic" approach to issues pertaining to the mind as well as medical profession but once you have heard him once you will understand his approach. I hope this review helps. Clear thinking is valuable beyond measure! First off, let me preface this review by saying I was already familiar with Steven Novella through his podcast, The Skeptics Guide to the Universe. 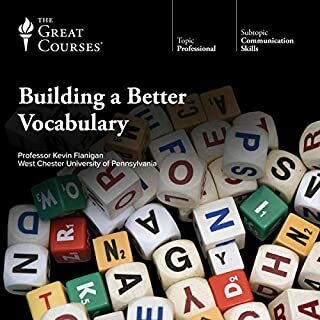 When I heard he had this series of lectures available on Audible, I was quite excited! 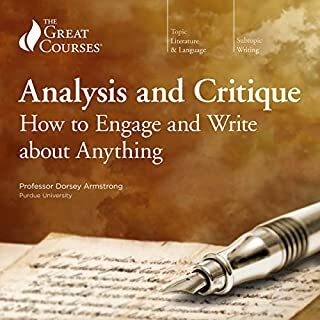 I was hoping for a clear, detailed and thorough treatment of Critical Thinking - and Novella delivers in spades, covering topic after topic with a treatment that is brisk, peppered with examples, constructed in a logical and understandable manner and order, and delivered eloquently. The content is exactly what is says on the tin: if you are interested in Critical Thinking, in knowing how you think and how TO think -- there is no fat here. Logical fallacies and cognitive biases are examined, illustrated and explained. 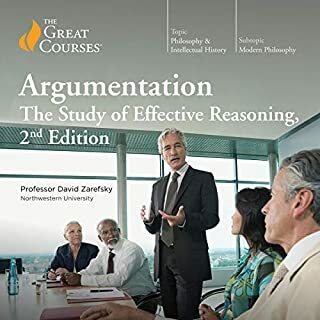 I would caution the potential listener that this is a series of lectures on a specific subject; I enjoyed it immensely because I happen to be interested in the topic. If I didn't have that interest or I was expecting more of a narrative-type production, I think I would be disappointed. A further caution: if you have a set of "alternative beliefs", prepare to be challenged! Examine the unfavorable reviews to see this side of things. 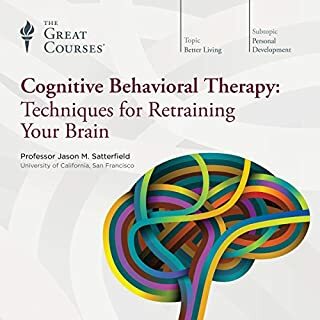 However -- and in summary -- if you desire to develop your Critical Thinking skills, to build the sharpest reasoning possible for yourself, or just to explore a scientific approach to understanding how your brain plays tricks on itself, then I give this work the highest recommendation! The organization of these lectures was very good. The material was not new for me - if you have read Dan Ariely, Daniel Kahneman or Michael Schermer, etc. then the concepts will not be new - but it was a great reminder and I particularly liked the way the material flowed and was organized. Very logical. The narration by the professor was excellent. Great diction and pace. These are essential concepts that are good for me to remind myself of at least once a year. For me personally, nothing really new here. Listening to podcasts from Sam Harris and "you are not so smart" will more than adequately cover the subject but in and of itself it is a good collection of ideas that one is well served to listen to if you have not spent much time looking into this domain before. What did you love best about Your Deceptive Mind: A Scientific Guide to Critical Thinking Skills? I don't know that there was any one scene (lecture) in particular that was more compelling than the next. I did enjoy the lectures that discussed scientific greats throughout history that alllowed their biases to derail or misguide further achievements. the key to the title of this book is A "SCIENTIFIC" guide to critical thinking. 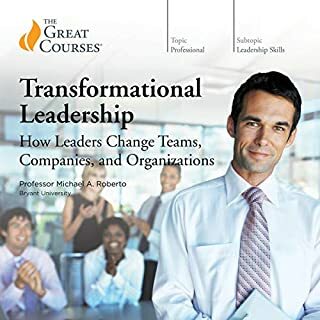 Shame on me for not figuring this out, out of the gate, but I originally downloaded this due to an interest in "strategic" thinking in the workplace. While there are undoubtedly parallels in terms of the process of thinking and good information with respect to recognizing biases and how the brain/memory work...this is very much a discussion on debunking or veryifing scientific evidence versus any non-scientific business process. It's a very good listen nontheless but not what I was expecting and not overly applicable to a corporate business setting (which again, is my own mistake). I only point this out in case anyone else struggles with reading comprehension like I did. Someone who wants a brief overview of a lot of quirky things the mind does, but doesn't really want to know why or how it does those things. 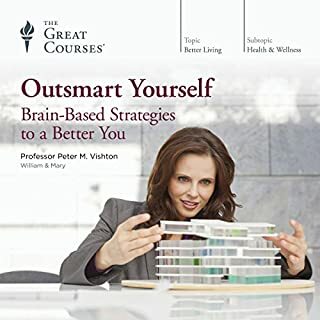 I don't see how this is a "Guide to critical thinking", he literally just tells you stories of times the mind has done strange things contradictory to logic. It was all stuff I've heard before, several times, from other sources. There was no delving deeper into the why our minds do the things he says in the numerous examples. It was more stories of strange things our minds do, with a one sentence recap of why the mind did it (possibly), and then on to the next story. Literally I think almost everything in the first two chapters was in the Nat Geo show Brain Games. 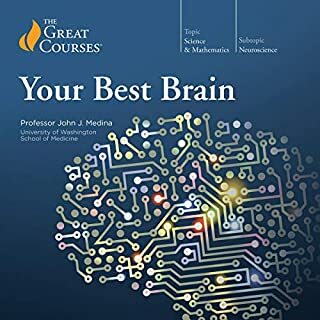 Most of the facts and ideas presented in this course are well known to everyone who has read a bit about or heard from modern "mind science" or "how our brain works" talks. Yet, Novella's roundup is great to listen to, well paced, always interesting and well worth both time and energy spent. I really enjoyed, for once, a scientist to remind the listener that he, the scientist, does not know it all and will probably not be right all the time. For one time a tutor explains, in detail, that using your own brain and mind means to check the facts and not just play along. A fair approach. What other book might you compare Your Deceptive Mind: A Scientific Guide to Critical Thinking Skills to and why? M. Shermer's "The Believing Brain" is quite similar in general approach, but concentrates too much on personal vendetta of the author and/or believe system. There are more comparable titles, but most, in my eyes (ears), suffer from the same basic problem: Scientists that want to make you BELIEVE that they do not need to believe, because they know all the facts for fact, are ... wretched(?). Most comparable books start of with or repeat sentences like "well, we know for a fact that ..." - and that, exactly, is not scientific thinking. It's religion. Novella does not fall for this. What does Professor Steven Novella bring to the story that you wouldn’t experience if you just read the book? Most books that cover the same topic come up with the ever repeating "experiments" that "scientists" have done, some of which date back to the 1930s or whatever. These experiments as well as the conclusions drawn from them are not that convincing, in setup, target and evidence. Yet, "science" seems unable to come up with new studies, new experiments and new approaches, so most books chew through the same data over and over again, almost in religious circles. Novella gets around this quite well by just shortly pointing towards those experiments, but explaining thought processes and prejudices in more "today's" contexts, seemingly being still in contact with the real world and not lost in "scientist's drinking clubs". His narration, wit, pointyness (does that word exist?) and personal involvement make you believe he actually means what he says, yet has the distance to always remember you: He might be wrong. 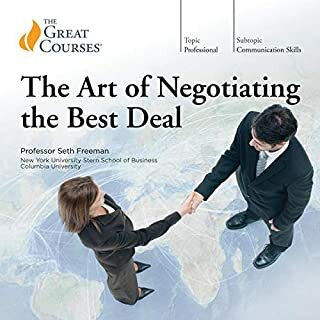 There are a few "funny" side notes that are funny enough to make you giggle or even laugh for a moment, but overall the pace (30 minute lectures) and dedication is just about right to not NEED jokes or horror stories. Can you expect "new insights"? No, if you have ever read anything about modern brain science or mind theory. 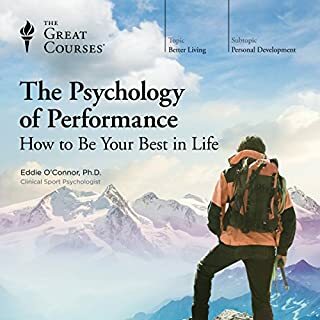 Are you looking for a sumup of the current "believe" in why we believe and how we err in making up our minds: This is a great approach that won't even harm a religious listener (and those are often the targets of pity for so many other authors/teachers). As another listener stated, this should be required listening for everyone. I honestly feel like that the skills I learned as a result of these lectures have made me a more observant, overall better person. I have a better grasp on the reality of the world around me because I learned how to pierce through the crap, and really wonder why and how things happen. Thank you Professor Steven Novella for sharing your wisdom. It’s less about thinking skills and more about thinking pitfalls. When reading the title to this book. 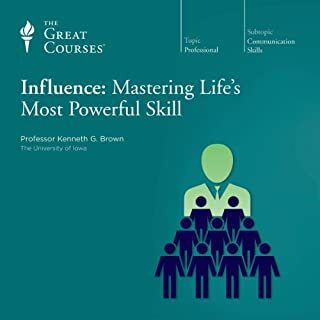 I was under the impression that we might be taught some type of skills to help tap into the parts of our brain that were not using, or have been programmed into overlooking. 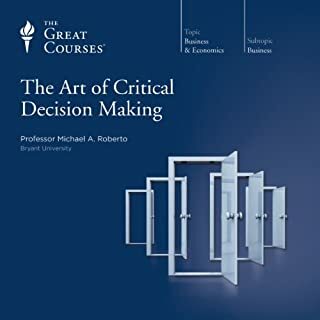 What I listen to seemed to be a class in thinking pitfalls that most people fall into, and less about critical thinking skills. Some interesting stories and concepts, but don't get this if you're looking for good tangible techniques to really improve your critical thinking skills.